If you follow jay Kaeppel’s posts in this blog, you’ll know that he’s the master of research on all things seasonal. This past week he posted a seasonal article on energy using FSESX – Fidelity Select Energy Services. Previously he had noted the bullish tendency for ticker FSESX during the months of February, March and April. In his follow up piece, he added one more “favorable” month and then also looked at a 6-month “unfavorable” period. The article is included at the end of this post so you can see the results.As Mutual funds are not for everyone, we went in search of alternative tickers that could closely match FSESX in performance characteristics. Using WinWay Matchmaker we compared the price action of FSESX against our universe of stocks and ETFs looking for a match. Matchmaker uses Spearman Rank Correlation analysis to identify a close match to FSESX. The closer the result to 1000, the higher the correlation. Anything over 950 is a very close match. Here’s the results. The ETF IEZ – iShares Oil and Equipment & Services showed a very high correlation over the 4 years we tested. 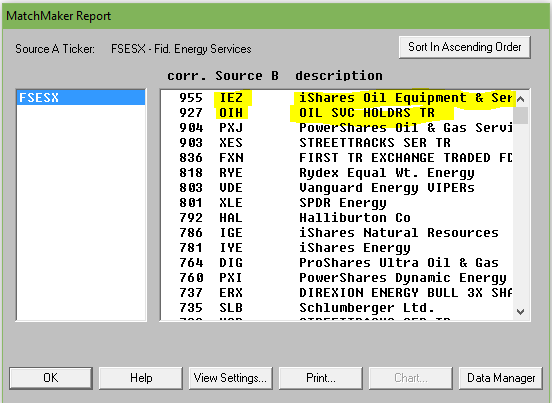 OIH – Oil Service Holders, another ETF, also showed high correlation. Here’s a WinWay overlay chart of recent daily price action comparing FSESX vs IEZ. Figure 2. Recent daily price action comparing FSESX vs IEZ. IEZ appears to be a good surrogate for FSESX at least over the last 4 years. We also wanted a visual of the seasonal pattern in action. Fortunately we have a tool still in development at WinWay that’s just right for this. Basically it provides a price comparison of ‘x’ numbers of years of the same ticker overlaid on each other. Figure 3 – IEZ seasonal chart (beta) for 3 years with average. The Feb, Mar, Apr period has a definite bullish tendency, the Dec period does Ok too. You’ll notice the tendency for IEZ to fall sharply in January. Conclusion? IEZ is a reasonable surrogate for FSESX if you’re contemplating this seasonal move. If you are looking for a market sector with some serious seasonal trends, look no further than the energy sector. Previously I had noted the bullish tendency for ticker FSESX during the months of February, March and April. In this piece, we will add one more “favorable” month and then also look at a 6-month “unfavorable” period. For the record, the information that follows is not being recommended as a standalone strategy. It is presented simply to make you aware of certain long-term trends that have been very persistently bullish (or bearish as the case may be) in the energy sector. Figure 1 displays the growth of $1,000 invested in ticker FSESX only during these four months every year since 1986 versus simply buying-and-holding ticker FSESX. Starting in 1986, an initial $1,000 investment grew to $76,019 (or +7,500%) versus $10,237 (or 923%) using a buy-and-hold strategy. The six “Unfavorable” months are June, July, August, September, October and November. *During 4 separate years – 1997, 2003, 2004 and 2010 – the “unfavorable” months registered a cumulative gain in excess of +30%. Doesn’t sound all that “unfavorable” so far does it? But here’s the catch: Despite the occasional 30%or more gain, it is fair to refer to this 6-month period as “unfavorable” as the cumulative long-term results of buying and holding FSESX during these months has been nothing short of devastating. Figure 2 displays the growth of $1,000 invested in ticker FSESX only between the end of May and the end of November every year starting in 1986. Figure 3 displays some comparative data between favorable and unfavorable periods as well as using a Buy-and-Hold strategy. Figure 4 displays the year-to-year results for a Buy-and-Hold approach versus holding only during the 4 “favorable” months or the “Unfavorable” 6 months. There is no guarantee from year-to-year results of buying and holding ticker FSESX during the “Favorable 4” months will show a gain and/or outperform the “Unfavorable 6” months. And there is by no means any guarantee that the “Unfavorable 6” will show a loss during any given year (note that 2016 saw the Unfavorable 6 generate a cumulative gain of +20.1%!). So just remember that we are talking about some very long-term trends here. Not every indicator that you look at needs to generate exact buy and sell signals. There are many useful indicators that offer “perspective” more than “precision market timing.” It can be very helpful to track some of these. But the basis for considering tracking certain “perspective indicators” is that they can help to keep you from falling for those age-old pitfalls, “fear” and “greed”. As the market falls – and especially the harder it falls – the more likely an investor is to start to feel fear. And more importantly, to start to feel the urge to “do something” – something like “sell everything” to alleviate the fear. On the flipside, when things are going great there is a tendency to ignore warning signs and to “hope for the best”, since the money is being made so easily. So today let’s review one of my favorites. OK, I will admit it is one of my favorites because I developed it myself. Although in reality the truth is that it simply combines one indicator developed long ago by Norman Fosback and another that I read about in a book my either Martin Pring or Gerald Appel. *High readings (90 or above) suggest a lot of “churning” in the market and typically serve as an early warning sign that a market advance may be about to slow down or reverse. That being said, a close look at Figure 1 reveals several instances where high readings were NOT followed by lower prices. However, as a perspective indicator note the persistently high reading starting in late 2014. This type of persistent action combined with the “churning” in the stock market could easily have served as a warning sign for an alert investor. *Low readings (20 or below) indicate a potential “washout” as it indicates a dearth of stocks making new highs. Readings under 10 are fairly rare and almost invariably accompany meaningful stock market lows. Figure 1 displays the Nasdaq Composite (divided by 20) with the JK Hi/Lo Index plotted since 2011. Regarding the difference between a “timing” indicator and a “perspective” indicator, note the two red lines in Figure 2. The JK HiLo Index first dropped below 20 on the date marked by the first red line. It finally moved back above 20 on the date marked by the second red line. Can we say that the JK HiLo Index “picked the bottom with uncanny accuracy”? Not really. The Nasdaq plunged another 10% between the first date the indicator was below 20 until the actual bottom. Still, can we also say that it was useful in terms of highlighting an area where price was likely to bottom? And did it presage a pretty darn good advance? I think a case can be made that the answers to those questions are “Yes” and “Yes”. The bottom line is that while there was a great deal of fear building in the market during January and February, an indicator such as this one can help alert an investor the fact an opportunity may be at hand. It’s the beginning of the month and time to check the seasonal patterns for August 2014. First off some background. Our study looks at 7 years of historical data and looks at the returns for all optionable stocks for the month of August from 2006 to 2013. We do make an assumption that the month is 21 trading days and work our way back from the last day of the month. If the last day of the month falls on a weekend, then we use the first trading day prior to that date. We make no assumptions for drawdown, nor do we look at the fundamentals behind such a pattern. We do compare the stock to the market during the same period and look at the average SPY gain/loss vs. the average stock gain/loss. This helps filter out market influence. We are now including group information to identify particular segments that might display a seasonal bias. Finally we look at the median gain/loss and look for statistical anomalies, like meteoric gains/loss in one year. So here are the tickers that met the scan on the loss side, There was only 1 stock on the gainers side. So we’ll look at the down plays only. Figure 1 shows the stocks that have had losses in August, 7 years in row. 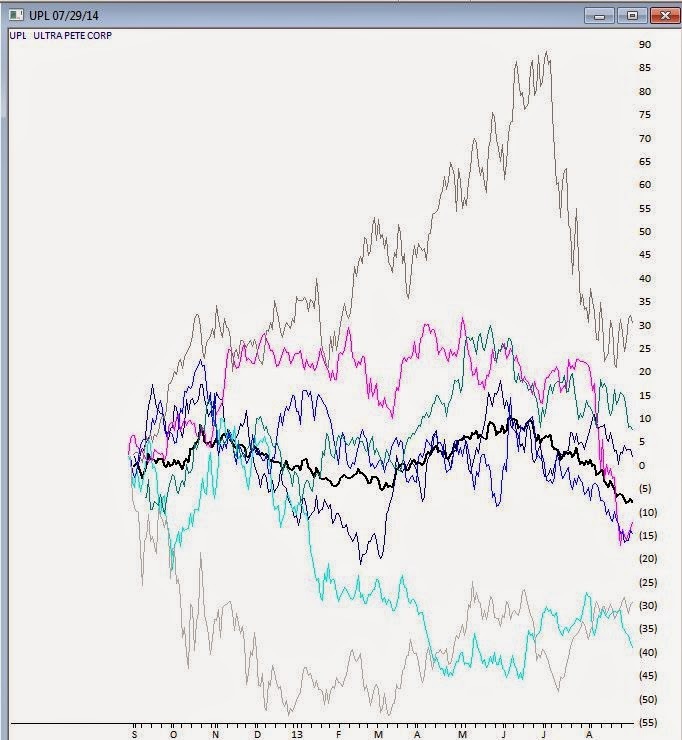 It’s almost immediately apparent that 4 of the 6 losers are in the Oil & Gas sector, one in the Drilling group, and 3 in Exploration and Production (2 US) groups. Not looking like a good month to be long this sector. The biggest loser is UPL, UltraPete Corp with an average -9.66% in August. A couple of years have seen significant losses in August, but the median is still -7.42%. Not being one to speculate on why the Oil & Gas sector has so many stocks taking a hit in August, but there it is. Here’s the seasonal chart of UPL through 8/31/2013, the prominent black line is the average of the 7 years in the study. Figure 3 shows SPY for the same period. Interestingly a quick check of the Oil & Gas US Explorations and Production group for the same period revealed an average decline of -3.67% in August. The entire group was down 6 of the last 7 years in August. I have 38 stocks in this group in my database. We’ll keep track of the top 2 stocks in the August analysis. UPL and DNR and let you know how they preform. In July, GLNG was the seasonal star with an average of +8.41% for the 7 years through July 30, 2013. Tracking how it performed this July, GLNG opened at 60.73 on July 1, 2014 and reached a high of 65 on July 30, 2014. Some pullback occurring on July 31, 2014 with the entire market down, but still a gain for the month. Figure 5 shows the stocks that have had gains in July, 7 years in row. With seasonality you have to figure out what timeframe you want to analyze before anything else. Logic would seem to dictate that one week; comparing this week to the same period over X years would be the smallest time period you might consider. However there are events that seem to be seasonally predictable that occur at the end of a month or the beginning of the month. We’ll look at some these in a future article. We don’t draw conclusions here, just mine for information. Hi, my name is Jay and I am a Seasonalaholic. Now typically when someone confesses to being an “aholic” of some sort or another it because they recognize they have a problem and wish to correct it. That’s not the case here. In fact the “support” group that I belong to is not “Seasonalaholics Anonymous” but rather “Seasonalaholics Unanimous!” (OK, in the interest of full disclosure, so far I am the only member and yes, the monthly meetings aren’t terribly lively, but I digress). -And then earned 1% of annualized interest while out of the market the other 8 months. The answer is contained in Figure 1 which displays the growth of $1,000 invested as described above. Figure 1 – Growth of $1,000 invested in FSRPX during February, March, October, November (blue line) versus buying and holding the S&P 500 red line) since January 1988. Now it is pretty impossible to not notice the, ahem, “slight drawdown” experienced during the October, November 2008 period. Still, despite the fact that I have tried very hard scrub that particular time period from my memory bank, I still have some vague recollection that virtually no sector of the stock market was left unscathed during that period. And the rebound has been pretty nice. So is this really a viable strategy? Well, under the category of “Everything is Relative”, Figure 2 displays the year-by-year performance of this “system” versus buying and holding the SP 500. The difference in the average annual return is not large (+10.9% for the system versus +9.6% for the S&P 500). But this difference adds up over time. Since January 1988 the system has gained +1,115% versus + 648% for the S&P 500 (while only being in the market 33% of the time. The true “numbers geeks” will notice that the standard deviation of annual returns for the system is only 2/3rds as large as that for the S&P 500 – i.e., much less volatility). So I ask again, is this really a viable strategy? Perhaps. But the truth is that it can get a whole lot better – as I will detail the next time I write.